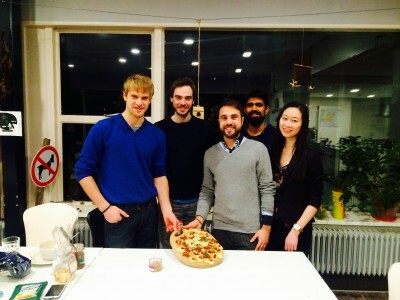 About a month ago, my study group for the course “insects as food and feed” won a contest organized by the course staff with the idea of “Crickerita”, a pizza with cricket powder in the dough. The prize was a ten euro voucher per person, to spend in supermarkets or various shops in Wageningen. After a while (the courses are quite intense and keep us all very busy) my group managed to find a night to spend together. The plan was of course to put in practice our contest winning idea, but achieving it was more difficult than we expected. First, we needed to get some crickets. In Wageningen there is a pet shop that sells them as feed for reptiles and birds, and also for arachnids or other insectivore insects like mantises. Unfortunately, the crickets sold in the pet shop are not fed with a high-quality diet, or at least not as high compared to the ones sold for human consumption. We decided then, to try our luck at Lazuur, a local organic shop that, according to many Wageningen students, sells insects for food purposes. I went there and I unfortunately discovered that they did not have them anymore, since the sales were not going well and it was not worth it to keep them as a product. 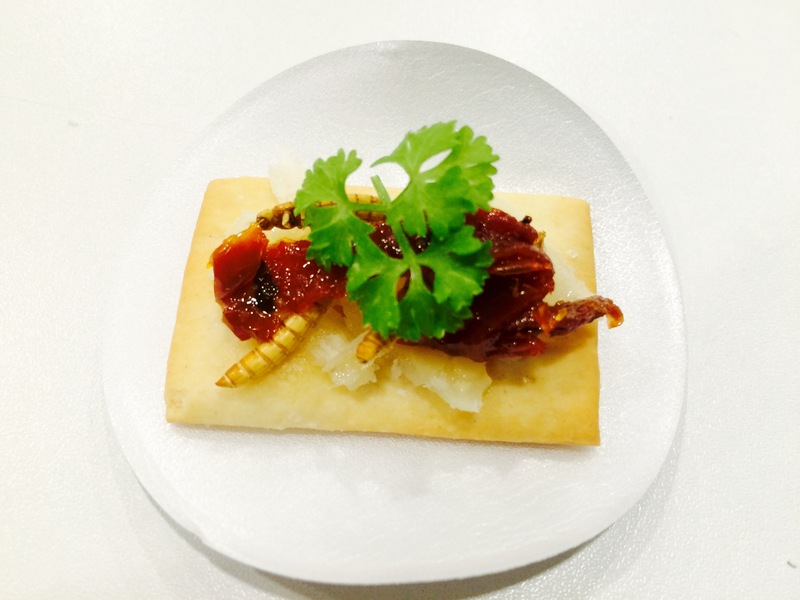 This was really disappointing to us, but at the same it is clearly understandable that people are reluctant to buy insects if they can recognize them, especially considering that the knowledge about their nutritional properties is not spread throughout consumers. Additionally, people have no idea how to cook them and this also contributes in reducing the appeal; probably, a good marketing of “The insect cookbook” (Arnold van Huis, Henk van Gurp, Marcel Dicke; Columbia University Press, 2014) would help people consider insects as an interesting addition to their diet. Our hope was almost lost, but we decided to make the last try in a popular Dutch supermarket, and…surprise! 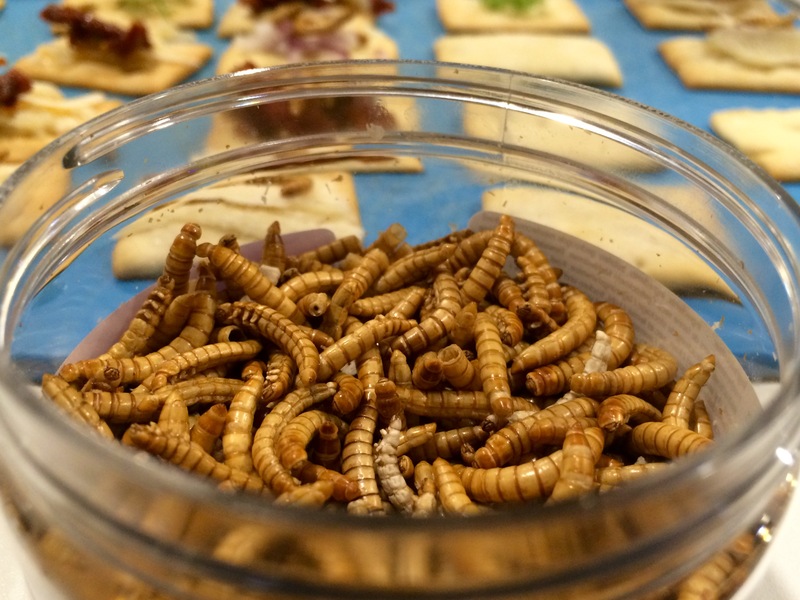 We found insect-burgers (Insecta – Damhert Nutrition, containing 14% of Alphitobius diaperinus, a coleopteran commonly known as buffalo worm) and dried mealworms (Tenebrio molitor) in a small 25g box. Unfortunately, no crickets at all, but we thought that the mealworm would work just fine, and we considered having a small cricket rearing for the next dinner (the crickerita idea is still alive, we just need more time and practice to achieve it). The next step was to find a way to eat them, since the Crickerita idea was clearly not feasible. We arrived at home and started looking for some recipes. In retrospect, we should have bought and followed the cookbook I mentioned before (and we will do it soon), but ended up making a sauce of dried tomato in olive oil blended with the mealworms. We basically made up an appetizer with small crackers, tomato-mealworm sauce, and parmesan. We all immediately noticed that, when insects are added to these other simple and light ingredients, the meal becomes more filling (probably due to the high protein and fat content in the insects). We also tried them straight out of the box, discovering that even the flavor is nice and they could be eaten alone as snacks in many situations. Finally, while enjoying our delicious buggy crackers, we imagined all the situations where they could easily replace nuts, pop-corn and chips, like a football match, a movie, or a dinner with friends.